Backup strategies are critical to enterprise data management, but the time, storage, and management requirements pose a host of challenges. Because companies are managing huge volumes of data, which continue to grow daily, the amount of time and storage required for backup processes can hinder database performance and ultimately, the customer experience. Available solutions and methods for doing backups have also limited the database administrator’s flexibility in managing backup processes efficiently. Scheduling major backups during off-hours, for example, still comes at great cost to the organization in time and system disruption. EnterpriseDB® (EDB™) is working to address the DBA’s challenges and provide more flexibility in managing backups. The EDB Postgres™ Backup and Recovery Tool currently provides support for taking Full Hot Backups; it takes a complete file-level backup of the database server while the server is still running. The next major release of EDB Postgres Backup and Recovery Tool will feature support for block-level incremental backup so the user can back up data that has changed since the last full or incremental backup. (EDB Postgres Backup and Recovery Tool v2.1 is planned for beta testing in December 2016.) This new capability will make backups faster and take up less storage space as well as make recovery operations faster to execute. In order to take an incremental backup, the user would need to pass the “--parent” switch to the EDB Postgres Backup and Recovery Tool BACKUP sub-command. Below is the help menu of EDB Postgres Backup and Recovery Tool BACKUP sub-command. Please note that EDB Postgres Backup and Recovery Tool incremental backup functionality will only work with EDB Postgres Advanced Server 9.5/PostgreSQL 9.5 and subsequent releases. It will not work with earlier versions. The user can always run the EDB Postgres Backup and Recovery Tool show-backups command in order to see details about the full or incremental backups taken so far. Restoring an incremental backup is also very simple. Simply provide the ID of the incremental backup and EDB Postgres Backup and Recovery Tool will restore all the incremental backup(s) in the chain as well as the corresponding full backup. PostgreSQL and EDB Postgres Advanced Server maintain the write ahead logs (WALs) in the pg_xlog subdirectory of the DATA folder. The WAL records every change that is made to the data files. The WAL files are primarily required in case of crash recovery; the database can be restored consistently to a current state by restoring the last base backup and replaying the WAL files. The purpose of mentioning this here is that the EDB Postgres Backup and Recovery Tool incremental backup feature is implemented by scanning the WAL files to identify the changes since the last backup. The WAL file contains all changes made to all data files. In order to provide the incremental backup feature, EDB Postgres Backup and Recovery Tool requires archiving to be enabled on the backup database server and the archive_command set to send the WAL files to the BARTHOST. Even today in the current version, using the BART INIT command, customers can automatically set the archive_command for the backup database server to send the WAL files from pg_xlog directory to BARTHOST. The block level incremental backup is implemented using the WAL scanning approach. On a high level, this is achieved by scanning and analyzing all WAL files collectively, or on a continuous basis, and copying the changed blocks from the database server to form an incremental backup. The incremental backup solution for PostgreSQL provided by other vendors is file based which, in simple terms, means that they will copy the entire data file even if there's only one small change in the file. Block level incremental backup will only copy the data blocks modified since the last full or incremental backup. 1. WAL Scanner: The primary goal of the WAL scanner is to scan the WAL file and generate MBM (Modified Block Map) files. These files will be later processed by the EDB Postgres Backup and Recovery Tool Harvester. The WAL scanner can run in the background or the foreground. When run in the background, the EDB Postgres Backup and Recovery Tool scanner will spawn a process for every database server that is interested in taking an incremental backup. The EDB Postgres Backup and Recovery Tool scanner process will scan WAL files for every server and generate MBM files. 2. Harvester: The purpose of the EDB Postgres Backup and Recovery Tool Harvester module is to process the MBM files for an incremental backup and produce a CBM (Cumulative Block Map) that contains all of the MBM files for a given incremental backup. The Harvester then fetches the changed blocks from the database server using libpq API. The Harvester module is invoked when the user executed the command to take an incremental backup. 3. Restorer: As the name suggests, the job of the Restorer module is to restore the incremental backup. As mentioned, every incremental backup has to have a parent full backup. It’s possible to take multiple incremental backups after a full backup but at the end of the chain there should be a full backup. The Restorer will restore the full backup and all the incremental backups in the chain. A typical use case for incremental backup for a large database would be the following. A DBA takes a full backup on the weekend, which consumes lot of space and takes a lot of time. Each weekday, the DBA takes an incremental backup, which takes significantly less space and time as they only back up data modified since the last full or incremental backup. It is also possible the DBA chooses not to perform a full backup every weekend; it can be done every two weeks or some other frequency. The benefit of taking the full backup every weekend is that in case of a having to do a restore on Friday, it will restore back to the last full backup from the prior weekend. If the full backup is multiple weeks apart, it will go all the way back to the last full backup. Significant reduction in time required for a backup. 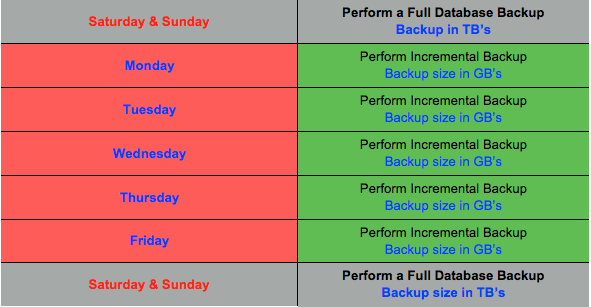 Taking a full backup of a large database can take a great deal of time; taking an incremental backup since the last full or incremental backup reduces that time significantly. Reduced storage requirements. Taking a full backup for a large database requires enormous storage space; an incremental backup will typically be much smaller as it’s only backing up the modified database blocks. Faster recovery with incremental backup and PITR. PITR with incremental backup will be faster because there would be fewer WAL files to be replayed after incremental backup restore as compared to replaying all WAL after the full backup. Ahsan Hadi is Senior Director, Product Development, at EnterpriseDB.